Hello and welcome to Monday, fray. 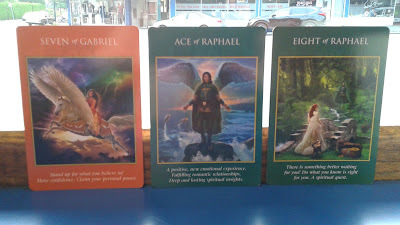 I have drawn three cards from my deck to inspire all of us in this group for the week ahead. The meanings are open for interpretations beyond my own, so please feel free to comment as your week unfolds. There are no major arcana cards in our forecast, so expect minor distractions over the next seven days. Gabriel's back for the beginning of this week. There's a bit of a storm behind us, but we've taken flight now to sunnier skies. "Stand up for what you believe in. Have confidence. Claim your personal power." How does this relate to you? Starting off the week with something you've been avoiding? Putting off that little talk you know you need to have? Staying calm, communicating and listening is always the way to go. Mid-week sees the Ace of Raphael enter our lives. Look for "A positive, new emotional experience. Fulfilling romantic relationships. Deep and lasting spiritual insights." Maybe a new friend? As always use caution on social media. You might feel like you're stuck between a rock and a hard place, but a couple of new people will come around and offer you a new perspective. 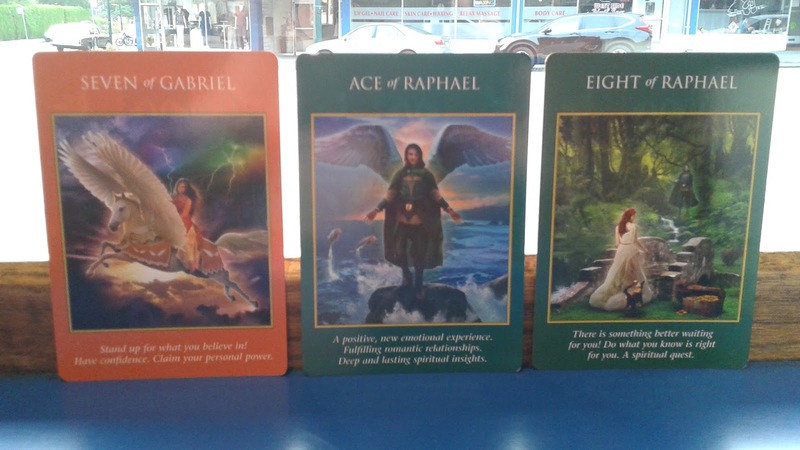 Raphael hangs around for a few days, letting us know "There is something better waiting for you! Do what you know if right for you. A spiritual quest." We all have doubts from time to time and tuning into ourselves is a good place to look for answers. Be kind to yourself. That bridge over trouble waters leads to a gentle brook, and that's just what you need right now.